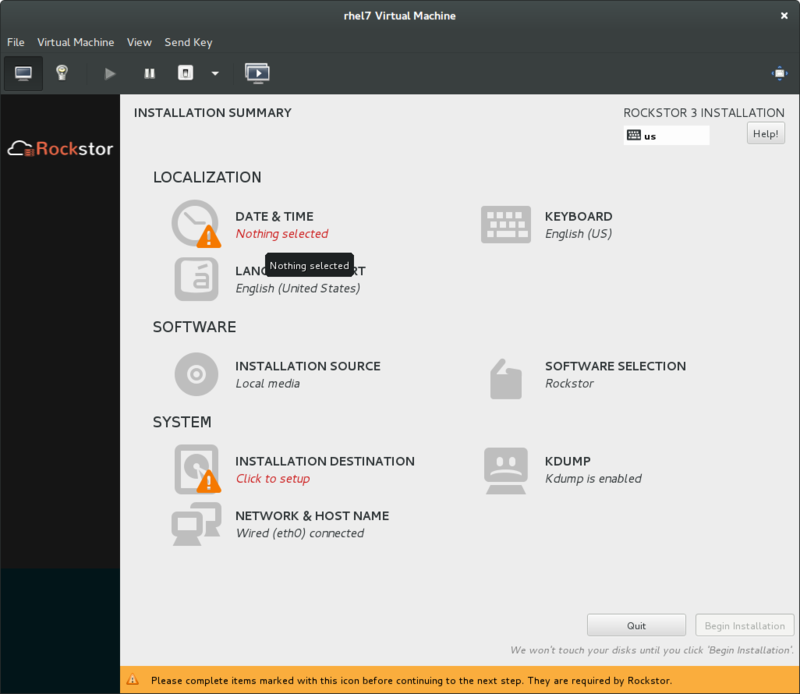 When reinstalling Rockstor or when the Installation Destination disk is not blank it is necessary to take a few more steps within the installer to prepare the system disk. 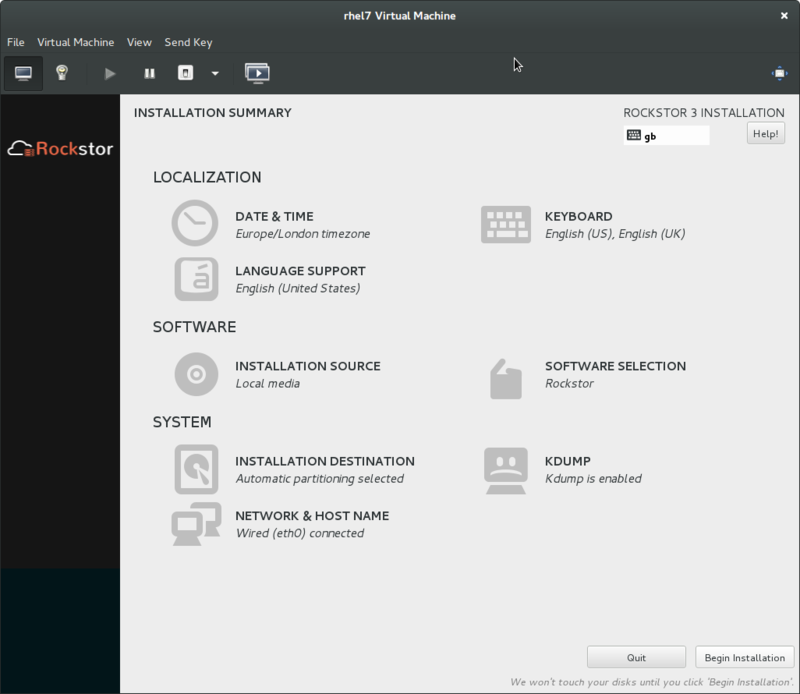 As Rockstor’s semi-automated installer expects a blank disk we must arrange this whenever the system disk already has partitions on it. 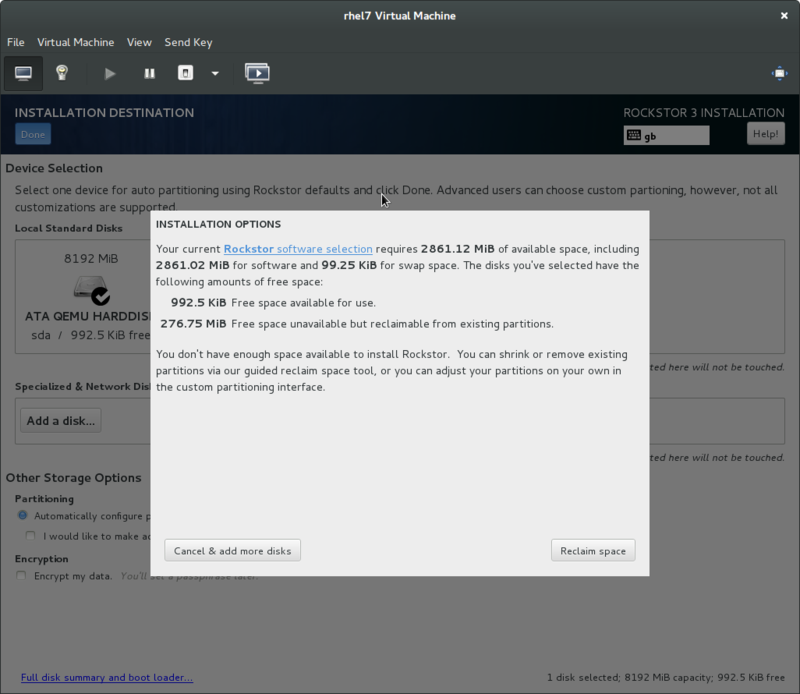 This will be evident from the Installation Summary screen by an exclamation mark next to Installation Destination. Note in the above we have attention required in Data & Time and Installation Destination. Date and Time simply needs to know your location to set the time zone. Note how there is only 992.5 KB free space due to a previous install. Ensure that the correct disk is ticked. Rockstor, with default boot options, will only show sda but if you see other disks due to custom boot options be very careful with where the tick is; there should be only one disk ticked. After pressing the Done button we get the following Installation Options dialog. Use the Reclaim Space button. On the resulting Reclaim Disk Space dialog, after assuring yourself that this is in fact the correct disk, click on the Delete all button. Click Reclaim space if you are certain this is the correct disk. We should now be back at the installation summary screen where we can Begin Installation as normal. We are now ready for a regular Installation as the system disk is now blank. Once Rockstor has been reinstalled and you have applied the updates via the automated prompt in the WebUI and rebooted if prompted to do so you can import the data that was present on your previous Rockstor install’s data disks; assuming you had separate data disks of course. N.B. given this is a new install it is advisable to reboot anyway to make sure all is well before doing the data import, this will ensure you are using all of what has just been updated. Data import is initiated by using the tiny down arrow icon next to a pool device member’s name on the Disks table / page of the Storage section. Please see the Import BTRFS Pool section of the Disks page for details and note that when importing via a partitioned pool member, additional configuration is required, but only for the first partitioned pool member. N.B. only one partition is supported per drive. If you have previously Created a Configuration Backup and downloaded the relevant file then you can now restore that configuration.